Someone said that a great man becomes greater after he died. When the news of the demise of President Kim Il Sung of the Democratic People’s Republic of Korea on July 8, 1994 was broadcast, many statesmen of the world mourned for the world’s outstanding veteran statesman. President Kim Il Sung played an outstanding role in the Korean people’s heroic struggle against Japanese colonial rule and the US aggression by dint of wise leadership, steadfast resolution, principle and will. We are well aware that he staunchly championed the Non-Aligned Movement and all causes of justice, freedom and peace and the people’s well-being, contributed to developing the world’s socialist ideology and made great efforts to ensure stability on the Korean peninsula. I look back on my meeting with him with deep emotion, and will never forget the affection and respect he expressed for our revolution and people and the unqualified support he rendered to our people’s efforts and will to defend the national dignity and prevent war, as well as to all the programmes for economic and sci-tech cooperation between the two countries. 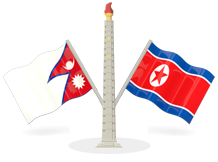 Surprised on receiving the sad news of the demise of President Kim Il Sung, I cannot suppress the feeling of deep sorrow. He passed away at a crucial time when unprecedented changes are taking place in the world arena and your country needs his outstanding leadership most. The world arena without him will feel empty for us. The then Indian prime minister Narasimha Rao visited the Korean embassy in his country and said in tears: The world lost a legendary man with the demise of President Kim Il Sung. He was the greatest and most outstanding statesman and leader. He was admired by the Indian people. The world knows many great men but no one excelled President Kim Il Sung. To look back on the long human history, many people were renowned for their distinguished ideology and military tactics. But no one had a good command of all fields including ideology and politics, the economy and culture, and military affairs as President Kim Il Sung did. Owing to his demise, the earth has become light as much. Among the G-7 leaders present here, only I had the honour of meeting President Kim Il Sung. He was a great head of state and one of the prominent statesmen who were active until now after the Second World War. The then Zimbabwean president Robert Mugabe said during his visit to the Korean embassy in Harare: Africa and the whole world, as well as the Zimbabwean people and I, lost a great friend. President Kim Il Sung rendered selfless material aid and moral support to us from the days when we were waging the national liberation struggle. His sincere assistance will remain in the memory of the Zimbabwean government and people for ever. He left a lasting imprint on the struggle to achieve the DPRK’s prosperity and development and global peace and advance. Indeed, he was a great man, great leader and great father. President Kim Il Sung was my closest friend. He did not die. He will live for ever in the minds of the Korean people and world people. Kim Il Sung was the most outstanding leader, man of the century and holy man of humankind, representing the 20th century.